Incidence of CIN as a whole in general population is 0.6%–2.3%, but it is notably higher among different disease subgroups. The accurate mechanism of contrast nephrotoxicity is not fully understood due to its multifactorial characteristics. Perhaps a combination of reduced medullary blood flow which leads to tissue hypoxia and a direct tubular injury due to toxic effects of contrast medium plays major roles in disease pathophysiology. Despite heterogeneity in the results of different studies, European Renal Best Practice suggests that volume expansion with solutions such isotonic sodium chloride or sodium bicarbonate (Bi) is more beneficial rather than no volume expansion. The rationale of administration of Bi or prescription of acetazolamide is that urine and medulla acidification is reduced with increased Bi excretion. Since oxygen free radicals are produced in acidic environment and their production is withheld or their effects are neutralized in alkaline settings, urine alkalization can be considered as a preventive method for CIN.,,,,, One can propose that administration of Ringer's lactate (RL) as a hydration solution to the patients can be beneficial. Since this solution contains less chloride that normal saline (NLS), it draws on less hyperchloremic acidosis. In addition, other studies have shown that restriction of chloride-rich solutions, although decreasing the risk of acidosis and renal failure, may give rise to incidence of metabolic alkalosis. Considering the fact that not many studies have focused on hydration with RL in prevention of CIN, this study was aimed to evaluate the effect of this solution in urine alkalization and also suggesting the more effective solution prevention of CIN. This study was performed from July 2015 until February 2016 as a prospective, single-center trial in the angiography unit of Shahid Faghihi hospital affiliated to Shiraz University of Medical Sciences. In this randomized, double-blind study, 300 patients >18 years old who had signed the consent sheet and were scheduled for angiography or angioplasty were studied. Patients with severe heart failure, pulmonary edema, hemodynamic instability or acid base disturbance, and those under dialysis or under medications affecting renal function were excluded. Patients were divided into three equal groups by simple randomization. The first group received 0.9% saline as 3 mL/kg 1 h previous to angiography and 1 mL/kg till 6 h post operation. The second and third groups received RL solution and isotonic Bi solution, respectively, with the doses mentioned above. The composition of isotonic Bi solution was 850 cc dextrose water 5% in addition to 150 mEq NaHco3. Neither the medical staff nor the patients were aware of the nature of the injected solutions and patients were selected using secret codes and simple random selection by a nurse who was not involved in the study. There were 47 (15.7%) patients with diabetes, out of whom 8 (17.0%) suffered from CIN. Patients who had increased non-fasting blood sugar >250 were managed by regular insulin. All three groups received 1200 mg oral N-acetyl cysteine tablets twice a day starting from a day before angiography till the day of contrast medium injection (48 h in total). Moreover, administration of metformin and diuretics was ceased 48 h before the procedure. Patients who had complications during or after angiography were excluded from the study. 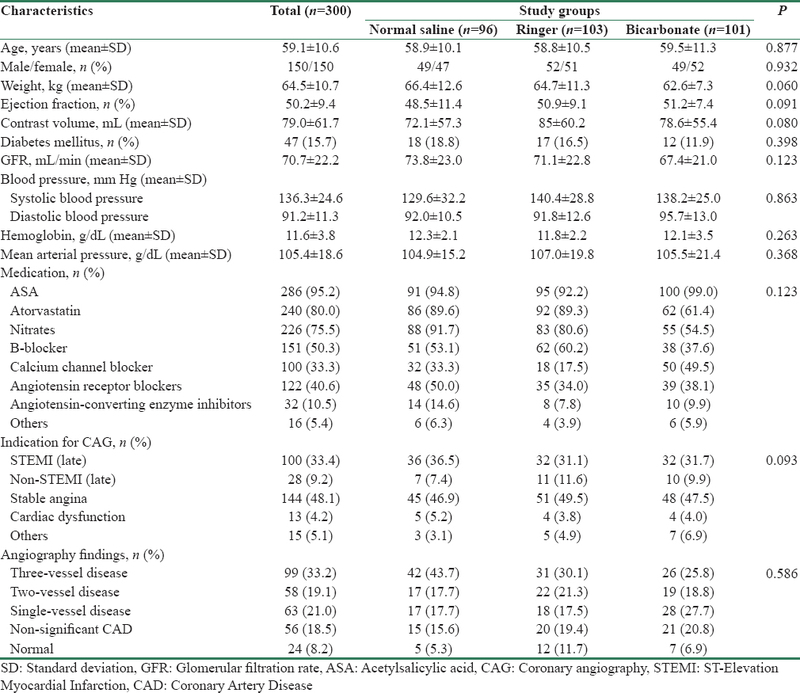 Laboratory data including serum blood urea nitrogen, Cr, Na, K, and urine pH were collected before and after angiography and their results were compared. Rise in serum Cr level more than 0.3 mg/dL or reduction in glomerular filtration rate (GFR) (calculated by MDRD equation) by 25% or more was considered as CIN. Nature of dye was Ultravist which was the same all through the study period and in all patients. The study was done in accordance with the Declaration of Helsinki and approved by the local ethics committee of Shiraz University of Medical Sciences. At the initiation of the study, patients were informed completely about the process of study, treatment side effect, and benefits. Then a written consent was taken. Data were analyzed by Statistical Package for the Social Sciences software version 18.0 (SPSS Inc., Chicago, IL, USA). Qualitative data are expressed as number and percentage, which were analyzed by Chi-square test. Quantitative data were presented as mean and standard deviation and analyzed by Student's t-test, analysis of variance test, and least significant difference test as a post hoc test in case the results were significant, and by paired T-test for comparison of characteristics in each group prior and after performing angiography. Multiple logistic regression with enter method was used to estimate the odds ratio (OR) of significant risk factors. All the variables of our study were analyzed by univariate test, and then we considered significant variables for interring variables into multivariate model. A P value of less than 0.05 was considered as statistically significant. In this study, 300 patients including 150 men (50%) with a mean age of 59.1 ± 10.6 years were studied. Patients were divided into three groups: NLS group with 96 cases, RL group with 103 patients, and Bi group with 101 participants. [Table 1] describes some of the demographic and clinical data of our patients; there was no significant difference in baseline data of three groups at the beginning of the study. The overall incidence of CIN in our study was 10% (30 patients) [8.3% (8 patients) in NLS, 16.5% (17 patients) in RL, and 5% (5 patients) in Bi group, P = 0.018]. Pairwise comparison showed that difference of CIN incidence was only significant among Bi and RL groups (P = 0.012). [Table 2] compares the characteristics between who developed CIN and those who did not. There was not significant difference in baseline GFR (78.4 ± 26.0 with CIN vs. 69.8 ± 21.6 without CIN, P = 0.154). Although baseline urine pH had no significant difference at baseline (5.1 ± 1.3 in CIN vs. 4.9 ± 1.1 in without CIN, P = 0.212), urine pH after trial in CIN group was lower than in who did not develop CIN (5.5 ± 1.4 vs. 6.3 ± 1.8, P = 0.024). In addition, delta of urine pH was higher in those who did not develop CIN (1.4 ± 1.8 vs. 0.4 ± 1.5, P < 0.001). [Table 3] presents comparisons of laboratory data before and after contrast administration among our patients. It revealed significant Cr level reduction (1.0 ± 0.2 vs. 0.9 ± 0.2, P = 0.007) and increase in eGFR (67.4 ± 21.0 vs. 72.2 ± 22.5, P = 0.003) in Bi group. The K level after trial was significantly different among three groups (P = 0.012); post hoc analysis showed significance level among RL and NLS (P < 0.001) as well as RL and Bi (P = 0.033). The K level was significantly decreased after injection of Bi solutions (4.4 ± 0.5 before trial vs. 4.2 ± 0.4, P = 0.030). The urine pH level after trial was significantly increased in all study population (4.9 ± 1.2 vs. 6.2 ± 1.8, P < 0.001) and also in each group (4.9 ± 1.3 vs. 5.4 ± 1.3 in NLS, 4.8 ± 1.0 vs. 5.7 ± 1.3 in RL, and 4.9 ± 1.1 vs. 7.5 ± 1.9 in Bi; P < 0.001). Additionally, after trail urine pH was significantly different among three groups (P < 0.001); post hoc analysis revealed that this significance was only between Bi and NLS (P < 0.001) and between RL and Bi (P < 0.001). Calculation of urine pH difference prior and after trial was significantly different in three groups (P < 0.001); the greatest delta urine pH was in Bi group; hence, higher urine pH and higher urine delta pH after administration were seen in Bi group. Delta GFR pre and post hydration was statistically significant only in Bi group and showed greater increase in GFR after hydration with this solution (P = 0.043). The results of regression analysis revealed use of RL versus Bi solution (OR: 5.9, confidence interval: 1.8–14.2, P = 0.004) as effective factor in prevention of CIN. At the end of this study, no patient needed renal replacement therapy and mortality was not seen in any group. In SPLIT randomized clinical trial in 2278 ICU-admitted patients, buffered crystalloid compared with NLS did not reduce the risk of AKI. Waters et al. in a study performed on patients undergoing aortic reconstructive therapy showed that excessive administration of NLS versus RL, despite saline-induced hyperchloremic acidosis, made no difference in complications, ICU stay, and hospital stay. Since few studies have focused on the effects of RL in prevention of CIN, we decided to evaluate the effect of this solution on prevention of CIN, which showed inferiority for RL in prevention of CIN. On the other hand, NLS showed more desirable results in prevention of CIN compared with RL; however, they were not statistically significant. We have reported previously that both Bi and AZ reduce the risk of CIN-related AKI; also in this study we showed that Bi has more protective effect rather than NSL or RL on prevention of CIN. No significant difference in prevention of CIN was seen in comparison of RL versus NLS and NLS versus Bi. It seems likely that hydration with Bi is more effective in prevention of CIN and our study could not prove superiority of RL over the two other solutions. In previous trials, urine alkalization has been proved to prevent CIN., Our study confirmed it as well. All the solutions in this study significantly increased urine pH. Therefore, considering the fact that delta urine pH in Bi group was remarkably greater than the others, the incidence of CIN was the least in this group. It is likely that more alkalinized urine comes with less incidence of CIN. Hypokalemia is one of the complications of Bi's injection. This phenomenon took place in our Bi group but it was not clinically significant. In this setting, RL brings about less hypokalemia rather than other solutions. The most important limitations of this study were small sample size and single-center study. Moreover, it would have been better to perform a comparison between serum pH alterations and serum Bi before and after hydration in each group. Bicarbonate solution is more effective than RL in prevention of CIN in patients undergoing coronary angiography. There was no significant difference between Bi group and NLS group. This article was extracted from the thesis written by Zahra Salmanpour with Grant No. 93-01-01-8921. The Vice-Chancellery of Research and Technology of Shiraz University of Medical Sciences financially supported this study. Brar SS, Shen AY-J, Jorgensen MB, Kotlewski A, Aharonian VJ, Desai N, et al. Sodium bicarbonate vs sodium chloride for the prevention of contrast medium–induced nephropathy in patients undergoing coronary angiography: A randomized trial. JAMA 2008;300:1038-46. Mehran R, Nikolsky E. Contrast-induced nephropathy: Definition, epidemiology, and patients at risk. Kidney Int 2006;69:S11-5. Pakfetrat M, Nikoo MH, Malekmakan L, Tabande M, Roozbeh J, Ganbar Ali RJ, et al. Comparison of risk factors for contrast-induced acute kidney injury between patients with and without diabetes. Hemodial Int 2010;14:387-92. Pakfetrat M, Nikoo MH, Malekmakan L, Tabande M, Roozbeh J, Reisjalali G, et al. Risk Factors for contrast-related acute kidney injury according to risk, injury, failure, loss, and end-stage criteria in patients with coronary interventions. Iran J Kidney Dis 2010;4:116-22. Thomas ME, Blaine C, Dawnay A, Devonald MA, Ftouh S, Laing C, et al. The definition of acute kidney injury and its use in practice. Kidney Int 2015;87:62-73. Andreucci M, Faga T, Pisani A, Sabbatini M, Russo D, Michael A. Prevention of contrast-induced nephropathy through a knowledge of its pathogenesis and risk factors. Sci World J 2014;2014:823169. Jorgensen AL. Contrast-induced nephropathy: Pathophysiology and preventive strategies. Crit Care Nurse 2013;33:37-46. Ad-hoc working group of ERBP, Fliser D, Laville M, Covic A, Fouque D, Vanholder R, Juillard L, et al. A European Renal Best Practice (ERBP) position statement on the Kidney Disease Improving Global Outcomes (KDIGO) clinical practice guidelines on acute kidney injury: Part 1: Definitions, conservative management and contrast-induced nephropathy. Nephrol Dial Transplant 2012;27:4263-72. Markota D, Markota I, Starcevic B, Tomic M, Prskalo Z, Brizic I. Prevention of contrast-induced nephropathy with Na/K citrate. Eur Heart J 2013;34:2362-7. Burgess WP, Walker PJ. Mechanisms of contrast-induced nephropathy reduction for saline (NaCl) and sodium bicarbonate (NaHCO3). Biomed Res Int 2014;2014:510385. Navaneethan SD, Singh S, Appasamy S, Wing RE, Sehgal AR. Sodium bicarbonate therapy for prevention of contrast-induced nephropathy: A systematic review and meta-analysis. Am J Kidney Dis 2009;53:617-27. Yunos NM, Kim IB, Bellomo R, Bailey M, Ho L, Story D, et al. The biochemical effects of restricting chloride-rich fluids in intensive care. Crit Care Med 2011;39:2419-24. Solomon R, Gordon P, Manoukian SV, Abbott JD, Kereiakes DJ, Jeremias A, et al. 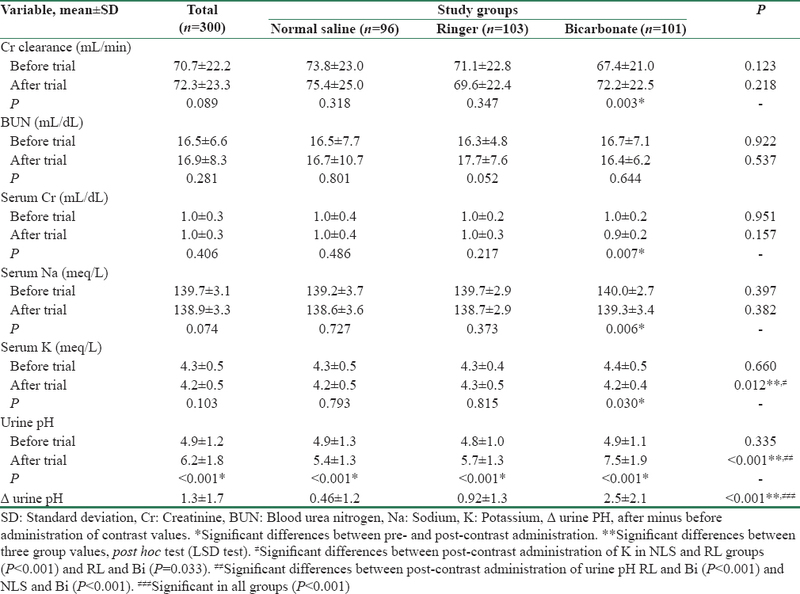 Randomized trial of bicarbonate or saline study for the prevention of contrast-induced nephropathy in patients with CKD. Clin J Am Soc Nephrol 2015;10:1519-24. Klima T, Christ A, Marana I, Kalbermatter S, Uthoff H, Burri E, et al. Sodium chloride vs. sodium bicarbonate for the prevention of contrast medium-induced nephropathy: A randomized controlled trial. Eur Heart J 2012;33:2071-9. Weisbord SD, Palevsky PM. Prevention of contrast-induced nephropathy with volume expansion. Clin J Am Soc Nephrol 2008;3:273-80. Andreucci M, Faga T, Pisani A, Sabbatini M, Michael A. Acute kidney injury by radiographic contrast media: Pathogenesis and prevention. Biomed Res Int 2014;2014:362725. Pakfetrat M, Nikoo MH, Malekmakan L, Tabandeh M, Roozbeh J, Nasab MH, et al. A comparison of sodium bicarbonate infusion versus normal saline infusion and its combination with oral acetazolamide for prevention of contrast-induced nephropathy: A randomized, double-blind trial. Int Urol Nephrol 2009;41:629-34. Tanaka A, Suzuki Y, Suzuki N, Hirai T, Yasuda N, Miki K, et al. Does N-acetylcysteine reduce the incidence of contrast-induced nephropathy and clinical events in patients undergoing primary angioplasty for acute myocardial infarction? Intern Med 2011;50:673-7. Kinbara T, Hayano T, Ohtani N, Furutani Y, Moritani K, Matsuzaki M. Efficacy of N-acetylcysteine and aminophylline in preventing contrast-induced nephropathy. J Cardiol 2010;55:174-9. Investigators A. Acetylcysteine for prevention of renal outcomes in patients undergoing coronary and peripheral vascular angiography main results from the randomized Acetylcysteine for Contrast-Induced Nephropathy Trial (ACT). Circulation 2011;124:1250-9. Morikawa S, Sone T, Tsuboi H, Mukawa H, Morishima I, Uesugi M, et al. Renal protective effects and the prevention of contrast-induced nephropathy by atrial natriuretic peptide. J Am Coll Cardiol 2009;53:1040-6. Yavari V, Ostovan MA, Kojuri J, Afshariani R, Hamidian Jahromi A, Roozbeh J, et al. The preventive effect of pentoxifylline on contrast-induced nephropathy: A randomized clinical trial. Int Urol Nephrol 2014;46:41-6. Kelly AM, Dwamena B, Cronin P, Bernstein SJ, Carlos RC. Meta-analysis: Effectiveness of drugs for preventing contrast-induced nephropathy. Ann Intern Med 2008;148:284-94. Merten GJ, Burgess WP, Gray LV, Holleman JH, Roush TS, Kowalchuk GJ, et al. Prevention of contrast-induced nephropathy with sodium bicarbonate: A randomized controlled trial. JAMA 2004;291:2328-34. Briguori C, Airoldi F, D'Andrea D, Bonizzoni E, Morici N, Focaccio A, et al. Renal Insufficiency Following Contrast Media Administration Trial (REMEDIAL): A randomized comparison of 3 preventive strategies. Circulation 2007;115:1211-7. Joannidis M, Schmid M, Wiedermann CJ. Prevention of contrast media-induced nephropathy by isotonic sodium bicarbonate: A meta-analysis. Wien Klin Wochenschr 2008;120:742-8. Bellomo R, Hegarty C, Story D, Ho L, Bailey M. Association between a chloride-liberal vs chloride-restrictive intravenous fluid administration strategy and kidney injury in critically ill adults. JAMA 2012;308:1566-72. Reid F, Lobo DN, Williams RN, Rowlands BJ, Allison SP. (Ab) normal saline and physiological Hartmann's solution: A randomized double-blind crossover study. Clin Sci (Lond) 2003;104:17-24. Hussmann B, Lendemans S, de Groot H, Rohrig R. Volume replacement with Ringer-lactate is detrimental in severe hemorrhagic shock but protective in moderate hemorrhagic shock: Studies in a rat model. Crit Care 2014;18:R5. Khajavi MR, Etezadi F, Moharari RS, Imani F, Meysamie AP, Khashayar P, et al. Effects of normal saline vs. lactated Ringer's during renal transplantation. Ren Fail 2008;30:535-9. Chowdhury AH, Cox EF, Francis ST, Lobo DN. A randomized, controlled, double-blind crossover study on the effects of 2-L infusions of 0.9% saline and plasma-lyte(R) 148 on renal blood flow velocity and renal cortical tissue perfusion in healthy volunteers. Ann Surg 2012;256:18-24. Ince C, Groeneveld AB. The case for 0.9% NaCl: Is the undefendable, defensible? Kidney Int 2014;86:1087-95. OMalley CM, Frumento RJ, Hardy MA, Benvenisty AI, Brentjens TE, Mercer JS, et al. A randomized, double-blind comparison of lactated Ringer's solution and 0.9% NaCl during renal transplantation. Anesth Analg 2005;100:1518-24. Hadimioglu N, Saadawy I, Saglam T, Ertug Z, Dinckan A. The effect of different crystalloid solutions on acid-base balance and early kidney function after kidney transplantation. Anesth Analg 2008;107:264-9. Young P, Bailey M, Beasley R, Henderson S, Mackle D, McArthur C, et al. Effect of a buffered crystalloid solution vs saline on acute kidney injury among patients in the intensive care unit: The SPLIT randomized clinical trial. JAMA 2015;314:1701-10. Waters JH, Gottlieb A, Schoenwald P, Popovich MJ, Sprung J, Nelson DR. Normal saline versus lactated Ringer's solution for intraoperative fluid management in patients undergoing abdominal aortic aneurysm repair: An outcome study. Anesth Analg 2001;93:817-22.